I tend to be careful not to take advice from anyone who hasn’t been in business for at least 5 years. This rule is not set in stone, but I like to get wisdom from people who have been there done, that and are still doing it. The people who have withstood the test of time, change and innovation. Mike Robertson is one of those people. Mike has been a friend of mine for a decade. He owns one of the top 10 Gyms in America voted by Mens Health, has influenced and improved the industry with the way they approach training at IFAST, and recently celebrated the 10-year anniversary of his gym; which just happened to be around the same time as we celebrated our 10-year at Vigor Ground Fitness and Performance. 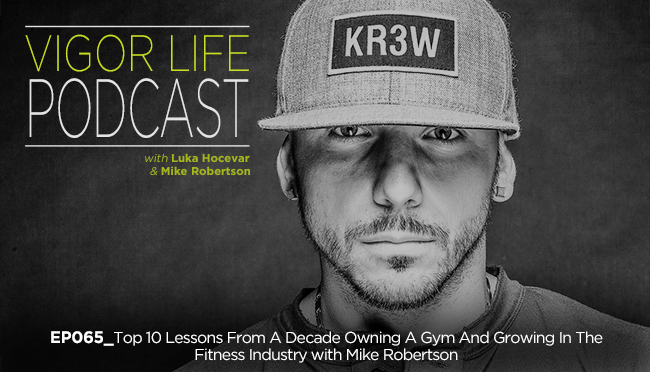 In this episode we talk about the 10 biggest lessons learned from owning a gym for a decade, as well as success in the fitness industry. This is a MUST listen for anyone in fitness or that owns a small business. This entry was posted in Podcasts and tagged Business, Coaching, Entrepreneurship, Fitness, Fitness Business, Performance, Self Development, Success, VigorLife. Bookmark the permalink.